Place the spices and and mint in a bowl and mix. Pour it out in a wooden surface. rub the rump steak with a little olive oil and roll the steak in the slice/herb mix to coat all sides of the steak. Heat a griddle pan and cook the steak to your liking. Rest the meat while you assemble the salad. Make the dressing by mixing all the ingredients, except the reduction or the honey and pour into a small jug. Assemble the salad leaves on a platter. Use a vegetable peeler and but the cucumber in thin long strips. Place on the salad leaves. Add the tomato and pomegranate pips. 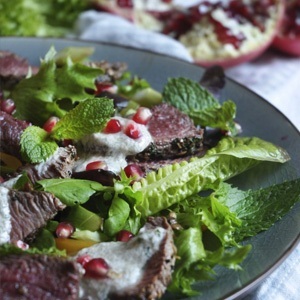 Cut the steak in thin strips and place on the salad leaves. Just before serving, spoon the dressing over the salad and finish off with the balsamic reduction or honey! Recipe reprinted with permission of Nina'sKitchen. To see more recipes,click here.